We present the design of a user study for comparing the security of two registration mechanisms for initializing credentials in machine authentication protocols, such as SiteKey. We discuss ethical and ecological validity challenges we faced in designing our study. In October 2005, the Federal Financial Institutions Examination Council (FFIEC) declared "single-factor authentication to be inadequate for high-risk transactions" . In response, many institutions attempted to implement two-factor authentication protocols by supplementing password-based authentication with machine authentication, which authenticates a user's computer as opposed to the user herself. Machine authentication systems typically recognize a user's computer with a previously stored token, such as an HTTP cookie, cache cookie, Flash Local Shared Object, etc. To successfully log in, the user must provide her password and the user's browser must present a valid token. Web sites currently using machine authentication include Bank of America , ING Direct  and Vanguard . Since users may use more than one computer, machine authentication protocols must have a procedure to authorize multiple machines. We call this the registration problem. In this paper, we present the design of a user study for comparing the security properties of two solutions to the registration problem: challenge questions and single-use email links. We discuss ethical and ecological validity challenges we faced in designing our study. Many machine authentication systems currently use challenge questions to address the registration problem [3,12,22]. A challenge question is a user-specific question which an adversary is unlikely to be able to guess an answer [8,17], e.g., "What is the name of your favorite teacher?" When a user creates her account, she provides the answers to one or more challenge questions, and when she attempts to log in from an unregistered computer, the site prompts her to answer these questions. If the answers are correct, then the site sets a persistent authentication token on the computer that authorizes it for future access. An alternative solution to the registration problem is to use email. If a user attempts to access her account from an unregistered computer, the web site sends her an email containing a single-use HTTPS URL with a random, unpredictable component. 1 After the user clicks on the link, the web site registers the user's computer with a persistent authentication token (e.g., a cookie) and invalidates the link. Several researchers have proposed using email in a similar way to help initialize authentication credentials [1,2,9,10]. Our study compares the security of email-based registration to the security of registration using challenge questions. Several researchers have persuasively argued that challenge questions are vulnerable to active man-in-the-middle (MITM) attacks [21,24], where an attacker spoofs the target web site and requires visitors to answer their challenge questions to proceed. This attack is likely to be effective because the unsafe action a user must avoid during the attack is the same action she must take to legitimately register her computer, i.e., answer her challenge questions. 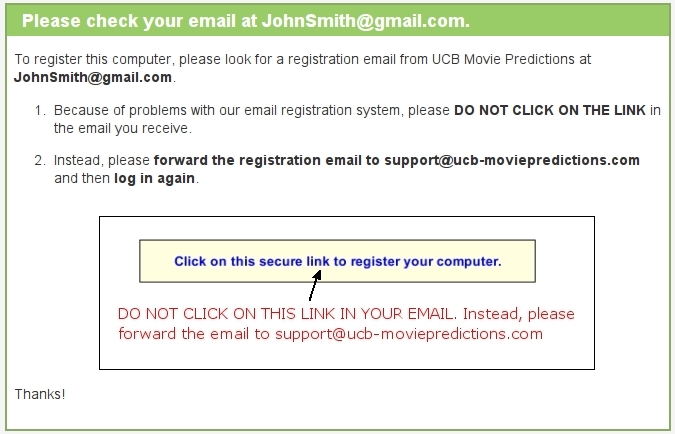 In contrast, with email registration links, the unsafe actions a user must avoid are different from the action she must take to legitimately register her computer, i.e., click on the registration link. Once a user clicks on a registration link and her browser sends it to the legitimate server, it becomes useless to an attacker. In addition, a web site can include a reminder in the registration email of the only safe action (i.e., click on the link) and warn against the likely attacks. Although a web site using challenge questions can issue similar warnings, these warnings will likely be absent during an attack. For these reasons, we hypothesize that using email registration links is more resistant to these types of MITM social engineering attacks than challenge questions. To test this hypothesis, our study will compare the success of different simulated MITM attacks against email registration links and challenge questions. First, it is difficult to simulate the experience of risk for users without crossing ethical boundaries . To address this, many experimenters employ role-playing, where users are asked to assume fictitious roles. However, role-playing participants may act differently than they would in the real world. If users feel that nothing is at stake and there are no consequences to their actions, they may take risks that they would avoid if their own personal information was at stake. Second, we must limit the effect of demand characteristics. Demand characteristics refer to cues which cause participants to try to guess the study's purpose and change their behavior in some way, perhaps unintentionally. For example, if they agree with the hypothesis of the study, they may change their behavior in a way which tries to confirm it. Since security is often not users' primary goal, demand characteristics are particularly challenging for security studies. An experiment which intentionally or unintentionally influences users to pay undue attention to the security aspects of the tasks will reduce its ecological validity. Third, we must minimize the impact of authority figures during the study. Researchers have shown that people have a tendency to obey authority figures and the presence of authority figures causes study participants to display extreme behavior they would not normally engage in on their own. Classic examples of this are Milgram's "shocking" experiment  and the Stanford prison experiment . For security studies, this tendency may underestimate the strength of some defense mechanisms and overestimate the success rate of some attacks. For example, if we simulate a social engineering attack during the study, users may be more susceptible to adversarial suggestions because they misinterpret these to be part of the experimenter's instructions. They may fear looking incompetent or stubborn if they do not follow the instructions correctly. This problem may be exacerbated if there is an experimenter lurking nearby. Fourth, we must identify an appropriate physical location for the experiment. The vast majority of previous security user studies simulating attacks have been conducted in a controlled laboratory environment. They are many advantages to a laboratory environment: the experimenter can control more variables, monitor more subtle user behavior, and debrief and interview participants immediately upon completion, while the study is still fresh in their minds. But a laboratory environment for a security study can cause users to evaluate risk differently than they would in the real world. A user may view the laboratory environment as safer because they feel that the experimenter "wouldn't let anything bad happen". It may be tempting to ignore some or all of these issues in a comparative study such as ours. Since the effects of these factors will be present in both the control group (i.e., challenge question users) and the treatment group (i.e, email registration users), then one might conclude that ignoring these factors would not hinder a valid, realistic comparison between the two groups. This is a dangerous conclusion. It is not clear to what degree these issues affect various types of security-related mechanisms. In particular, there is no evidence that these issues have a similar magnitude of effect on challenge question users as on email registration users. Therefore, it is prudent to control these issues in our design as much as possible. Our study employs deception to hide its true purpose. During the consent process, we tell users the project is examining how well individuals predict the outcome of certain events, and that this experiment focuses on how well individuals can predict high grossing movies. 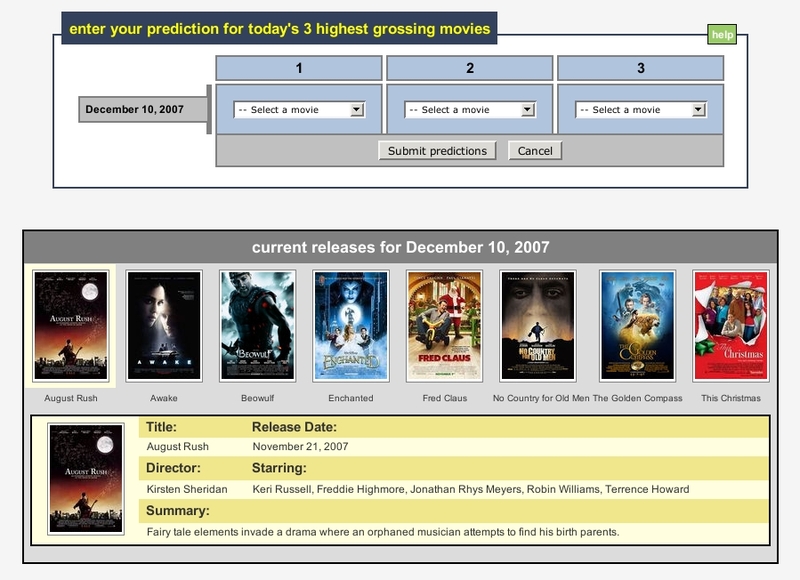 We tell each user she will log in to our web site over a seven day period and make a prediction of what she thinks will be the top three highest grossing movies each day. Each user logs in from her own computer, from anywhere, and at any time she wishes. We show a screenshot of our interface in Figure 1. We plan to recruit approximately 200 users, divided into 5 groups. One group uses challenge questions for registration and the other four groups use different variants of email registration links. We discuss the email registration groups further in Section 5.3.2. We show a summary of the different groups in Table 1. Table 1: Summary of study groups. Group Registration method Attack description Warnings? Each user creates an account at our site, with a username and password. We also ask for the user's email address and PayPal email address, if different. On a user's first login attempt, she is redirected to the page shown in Figure 2 after she enters her username and password. This page informs her that she must register her computer before she can use it to access her account at our web site. We wish to encourage users to register only private computers, so the site mentions that it is a generally a bad idea to register public computers and if the user is using one, then she should wait until later to register her private computer. However, we do nothing to prevent or detect a user registering a public computer, such as a library computer. If the user chooses to register her computer, we redirect her to the registration page. If she is in the challenge question group, we prompt her to set up her challenge questions with the dialog shown in Figure 3. She must select two questions and provide answers. After confirming the answers, she enters her account and proceeds with her first prediction. If she is part of an email registration group, then she sees a page informing her that she has been sent a registration email, and she must click on the link saying "Click on this secure link to register your computer". After clicking on the link, she can enter her account and make a prediction. We send registration emails in primarily HTML format, but also include a plain text alternative (using the multipart/alternative content type) for users who have HTML viewing disabled in their email clients. We embed the same registration link in both parts, but include a distinguishing parameter in the link to record whether the user was presented with the HTML or plain text version of the email. We discuss how we use this information in Section 5.3.2. Screenshots of registration emails are shown in Figures 6-9. Both registration procedures set an HTTP cookie and a Flash Local Shared Object on the user's computer to indicate the computer is registered. On subsequent login attempts from that computer, the user gains access to her account by simply entering her username and password. 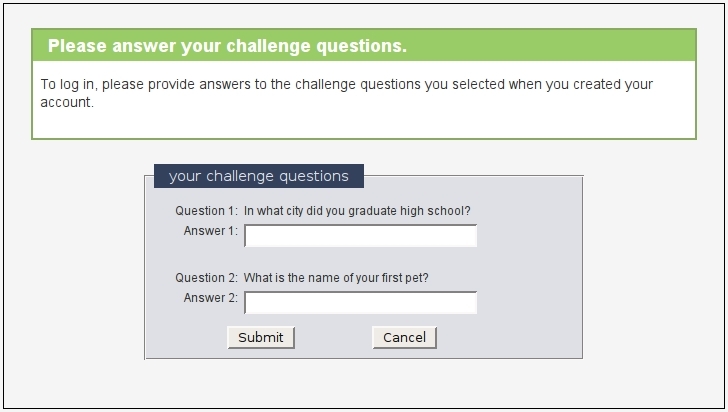 But if she logs in from a computer we don't recognize, then we prompt her to answer her challenge questions (Figure 4) or send her a new registration link to click on, depending on the user's group. Although we tell users they must make seven predictions to complete the experiment, after each user makes her fifth prediction, we simulate a MITM attack against her the next time she logs in. After she enters her username and password, we will redirect her to an "attack" server. The attack server uses the same domain as the legitimate server, simulating a pharming attack where the adversary has compromised the DNS record for our site. 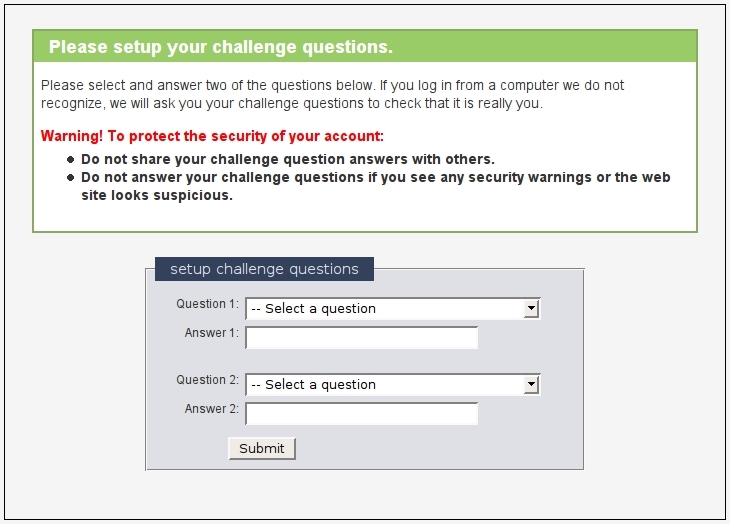 For the challenge question group, the attack simply tries to get users to answer their challenge questions by presenting the page shown in Figure 5. 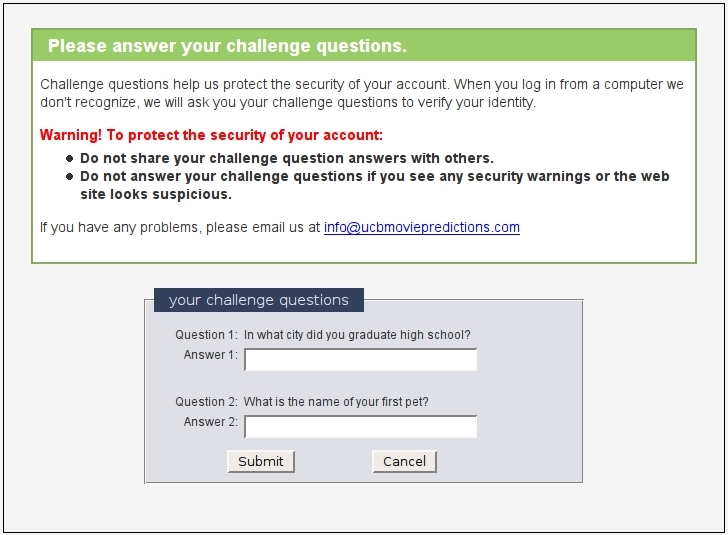 This is essentially the same page users see when they must answer their challenge questions under "normal" conditions, but with the warning and informative text removed.3This attack: 1) is straightforward, 2) closely mimics the legitimate registration process, and 3) was previously disclosed in the security community as a major weakness of challenge questions [21,24]. Simulating attacks against email registration is not as straightforward, in part because the attack must trick the user into doing something different than what she must do during a legitimate registration (i.e., click on the link). Ethical issues pose another challenge. To compromise email registration, a real world attacker might try to exploit a browser vulnerability, convince the user to install malware, or hijack the user's email account. Although these are typically effective attacks, ethical issues prevent us from attacking our users in this way. Instead, we use social engineering attacks that attempt to steal and use a valid registration link before the user clicks on it, giving the attacker a valid registration token for the user's account. Since this link has no value outside the scope of the study, this limits the potential risk to users. We identified two compelling and straightforward attacks of this type. Our first attack asks the user to copy and paste the registration URL from her email into a text box included in the attack web page. Our second attack asks the user to forward the registration email to an address with a similar looking domain. Although we have no evidence these are the most effective attack strategies, it is certainly necessary for an email registration scheme to resist these attacks in order to be considered secure. We simulate the copy and paste attack against groups 2 and 3, and simulate the forwarding attack against groups 4 and 5. For both attacks we assume the attacker can cause a new registration email to be delivered to the user from the legitimate site. For both attacks, the attack page first tells the user that "because of problems with our email registration system" she should not click on the link in the email she receives. For the forwarding attack, it instructs the user to forward the email to the attacker's email address. 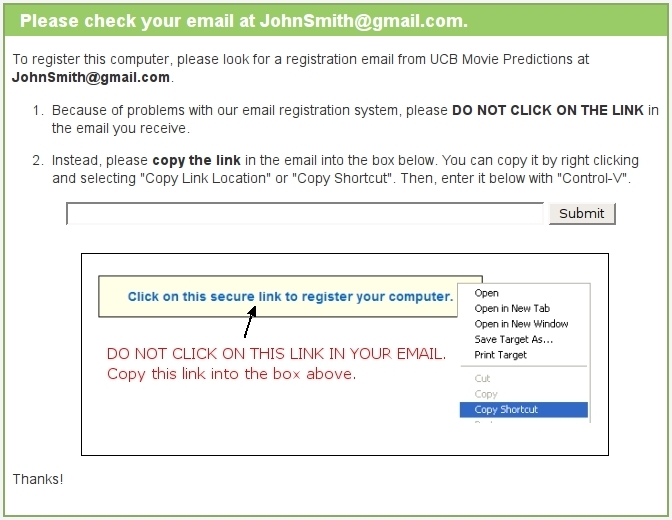 For the copy and paste attack, the attack page presents a text box with a "submit" button and instructs the user to copy and paste the registration link into the box. Both attacks also present pictorial versions of the instructions, with a screenshot of how the registration link appears in the email. To maximize the effectiveness of this picture, we give the attacker the advantage of knowing the distribution of HTML and plain text registration emails previously viewed by the user during the study (see Section 5.2). The attacker then displays the pictorial instructions corresponding to the majority; in case of a tie it displays a screenshot of the HTML version. Screenshots of these attacks are shown in Figures 10-13. Email registration has the advantage of being able to remind users of safe actions and warn them against unsafe actions. To measure the effectiveness of these messages, we subdivide the email groups into two groups: those that receive warnings in registration emails (groups 2 and 4) and those that do not (groups 3 and 5). Those that receive warnings also see these warnings on legitimate registration pages. Screenshots of these warnings are shown in Figures 6 and 8. Although these warnings specifically focus on the attacks we are simulating, and in the real world it may not be feasible to concisely warn users against all the possible attacks, a site can certainly warn users against the most successful or common attacks they have observed in the past. See Table 1 for a summary of the four different email groups. If a group 1 user answers her challenge questions correctly, we consider the attack a success and the experiment ends. We assume the adversary is relaying the user's responses in real time to the legitimate site, so if she enters an incorrect answer, the attack server prompts the user again. 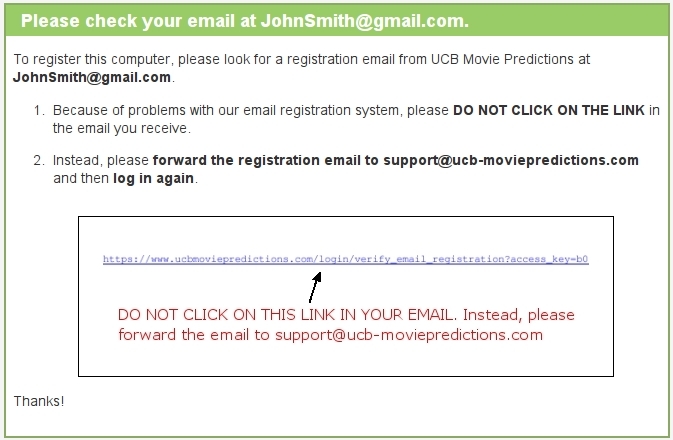 If a group 2-5 user clicks on the registration link first, then we consider the attack a failure.4 If the user forwards the email or submits the link first, then we consider the attack a success. Either way, the experiment ends. In this section, we discuss how well our design addresses the issues we identify in Section 4: simulating the experience of risk, limiting the effect of demand characteristics, minimizing the impact of authority figures, and avoiding any unrealistic environmental influences. We simulate the experience of risk by giving users password-protected accounts at our web site and creating an illusion that money they "win" during the study is "banked" in these accounts. To suggest that there is a chance that the user's compensation could be stolen if her account is hijacked, we provide an "account management" page which allows the user to change the PayPal email address associated with her account. However, these incentives have limitations. Users may still consider the overall risk to be low: the size of the compensation may not be large enough to warrant extra attention, or they may recognize that a small university research study is unlikely to be the target of attack. Informal testing suggests that predicting popular movies can be fun and engaging for users. In addition, the financial incentive for making accurate predictions will help focus the users' attention away from the security aspects of the study. For these reasons, the effect of demand characteristics is sharply diminished in our study. We minimize the impact of authority figures by requiring the users to participate remotely, from their own computers and at times of their choosing. Users never need to meet us or make any decisions in a laboratory environment. All instructions are sent through our web site and emails. Removing authority figures from the vicinity of users improves the validity of our study. Similarly, by requiring users to interact with our web site outside a laboratory, we increase the chances users evaluate risks similarly to the way they do in the real world. Nonetheless, we acknowledge that our study design is not perfect: there is some risk that users may interpret instructions from the simulated attackers as "orders" from us, the experimenters. Our study is ethical. The risk to users during the study is minimal, and for us to use a user's data, she must explicitly reconsent after a full debriefing on the true nature of the study. The study protocol described here was approved by the UC Berkeley's Institutional Review Board on human experimentation. Other researchers have attempted to design ethical and ecologically valid studies which simulate attacks against users. Several studies have attempted to evaluate how well individuals can identify phishing emails and pages [7,14,23]. However, these studies do not fully address the challenges we identified in Section 4. They were all conducted in a laboratory environment, and the users were either told the purpose of the experiment or asked to role-play a fictitious identity. To help create the experience of risk, Schecter et al. asked real Bank of America SiteKey customers to log into their accounts from a laptop in a classroom . Although SiteKey uses challenge questions, this study did not evaluate SiteKey's use of them. Instead, this study focused on whether each user would enter her online banking password in the presence of clues indicating her connection was insecure. They simulated site-forgery attacks against each user by removing various security indicators (e.g., her personalized SiteKey image) and causing certificate warnings to appear, and checked if each user would still enter her password. Since SiteKey will only display a user's personalized image after her computer is registered, Schecter et al. first required each user to answer her challenge questions during a "warm-up" task to re-familiarize her with the process of logging into her bank account. No attack was simulated against the users during this task. Requiring users to use their own accounts is certainly a good start for creating a sense of risk, but the degree to which the academic setting of the study affected the users' evaluation of their actual risk is unclear. Although the experimenters were not in the same room as the users while they used the computer, the fact that they were nearby may have influenced the users to appear "helpful" and behave with less caution than they normally would. Jagatic et al. and Jakobsson et al. designed phishing studies which remotely simulated phishing attacks against users without their prior consent. Although these experiments simulate real attacks and achieve a high level of ecological validity, not obtaining prior consent raises ethical issues. After learning that they were unknowing participants in one study , many users responded with anger and some threatened legal action . This paper presents the design of a user study to compare the security properties of two mechanisms for addressing the registration problem in machine authentication systems, identifies several ethical and ecological validity challenges we faced in designing our study, and discusses how we address them. In addition to teaching us more about the security properties of registration mechanisms, we expect this work will help broaden our understanding of the complex issues related to conducting these types of security studies. This work is supported in part by the TRUST Project (National Science Foundation award number CCF-0424422) and the iCAST Project. The conclusions in this paper are our own and do not necessarily reflect those of the NSF, the US Government, or any other funding agency. The authors also thank Rachna Dhamija, Allan Schiffman, Marco Barreno, Adrian Mettler, Monica Chew, AJ Shankar, Bill McCloskey, and the anonymous reviewers for their useful comments. In Proceedings of the Fourteenth ACM Conference on Computer and Communications Security (CCS 07), pages 48-57, October 2007. Usable Access Control for the World Wide Web. In Proceedings of the 19th Annual Computer Security Applications Conference, pages 406-416, December 2003. Bank of America SiteKey: Online Banking Security. Students Go 'Phishing' for User Info. Authentication in an Internet Banking Environment. Rachna Dhamija, J. D. Tygar, and Marti Hearst. In Proceedings of the SIGCHI Conference on Human Factors in Computing Systems, pages 581-590, 2006. Carl Ellison, Chris Hall, Randy Milbert, and Bruce Schneier. Protecting Secret Keys with Personal Entropy. Future Generation Computer Systems, 16(4):311-318, 2000. Email-based Identification and Authentication: An Alternative to PKI? IEEE Security & Privacy Magazine, 1(6):20-26, 2003. C. Haney, W.C. Banks, and P.G. Zimbardo. Study of Prisoners and Guards in a Simulated Prison. Naval Research Reviews, 9:1-17, 1973. Collin Jackson and Adam Barth. ForceHTTPS: Protecting High-Security Web Sites from Network Attacks. In Proceedings of the 17th International World Wide Web Conference (WWW 2008), April 2008. Collin Jackson, Daniel R. Simon, Desney S. Tan, and Adam Barth. An Evaluation of Extended Validation and Picture-in-Picture Phishing Attacks. In Proceedings of Usable Security (USEC'07), February 2007. Tom Jagatic, Nathaniel Johnson, Markus Jakobsson, and Filippo Menczer. Communications of the ACM, 50(10):94-100, October 2007. Markus Jakobsson and Jacob Ratkiewicz. In Proceedings of the 15th annual World Wide Web Conference (WWW 2006), pages 513-522, May 2006. Designing Authentication Systems with Challenge Questions. In Lorrie Faith Cranor and Simson Garfinkel, editors, Security and Usability: Designing Secure Systems That People Can Use, chapter 8, pages 143-155. O'Reilly, 2005. Dynamic Pharming Attacks and Locked Same-origin Policies for Web Browsers. In Fourteenth ACM Conference on Computer and Communications Security (CCS 2007), pages 58-72, October 2007. Stuart Schechter, Rachna Dhamija, Andy Ozment, and Ian Fischer. Emperor's New Security Indicators: An Evaluation of Website Authentication and the Effect of Role Playing on Usability Studies. In Proceedings of the 2007 IEEE Symposium on Security and Privacy, pages 51-65, May 2007. Christopher Soghoian and Markus Jakobsson. A Deceit-Augmented Man in the Middle Attack Against Bank of America's SiteKey Service. Min Wu, Robert C. Miller, and Simson Garfinkel. In Proceedings of the SIGCHI Conference on Human Factors in Computing Systems, pages 601-610, 2006. Fraud Vulnerabilities in SiteKey Security at Bank of America. To comply with the privacy requirements of UC Berkeley's Institutional Review Board on human experimentation, all user identifiers and other potential identifying information sent over a public network must be encrypted. SSL is a straightforward way to address this requirement. We force SSL for all connections to our site and all our cookies have the Secure flag set. We have purchased a certificate for our domain which is accepted by major web browsers. In a real world attack, a pharmer would most likely not be able to obtain a valid certificate for the target site and not initiate an SSL connection with users; otherwise, users would see a certificate warning. Since our hypothesis is that email registration is more secure than challenge questions, we must ensure that this artificial restriction does not bias the results against challenge questions. Our solution is to maximize the benefits of SSL for the challenge question users and minimize the benefits of SSL for the email registration users. To do this, we assume a potential adversary attacking email registration has obtained a valid certificate for the target domain while a potential adversary attacking challenge question based registration has not obtained a valid certificate. This means group 2-5 users do not see certificate warnings during the attack, but group 1 users do. We implement this by redirecting group 1 users to a different Apache instance (at port 8090) with a self-signed certificate, while group 2-5 users continue to use the original Apache instance in "attack mode". This means the "attack" domain shown in the URL bar for group 1 users will contain a port number, but the "attack" domain for group 2-5 users will not. After the experiment ends, we redirect each user to a page which debriefs her about the true purpose of the experiment and explains the reasons for deception. The debriefing page explains the concept of machine authentication and the different ways of registering computers. We then obtain reconsent from each user. If a user reconsents, we redirect her to an exit survey. Our exit survey starts with general demographic questions such as gender, age range, and occupational area. The second section of the survey collects information on the user's general computing background such as her primary operating system, primary web browser, average amount of time she uses a web browser per week, what kind of financial transactions she conducts online, and how long she has conducted financial transactions online. The final part of the survey asks more specific questions about the user's experiences during the study. One of our goals is to determine how much risk the user perceived while using our site. Since risk is subjective, we ask each user to think about the general security concerns she has while browsing the World Wide Web and the precautions she takes to protect herself when logging into web sites. Then, we ask her to rank how often and thoroughly she applies precautions when logging into the following types of web sites: banking, shopping, PayPal, web email, social networking, and our study site. Our second goal is to probe each user's thought process during the simulated attack. We ask her if she ever saw anything suspicious or dangerous during her interactions with our site, and if she did, what she did in response (if anything). On the next page, we show her a screenshot of the attack, and we ask her if she remembers seeing this page. If she did, we ask her whether she followed the instructions on the attack page and to explain the reasoning behind her decision. Our final goal is to understand each user's general impressions of machine authentication. We ask each user to describe how she thinks registration works and what security benefits she thinks it provides, if any. We also ask her to quantitatively compare the security and convenience of using machine authentication in conjunction with passwords to using passwords alone. 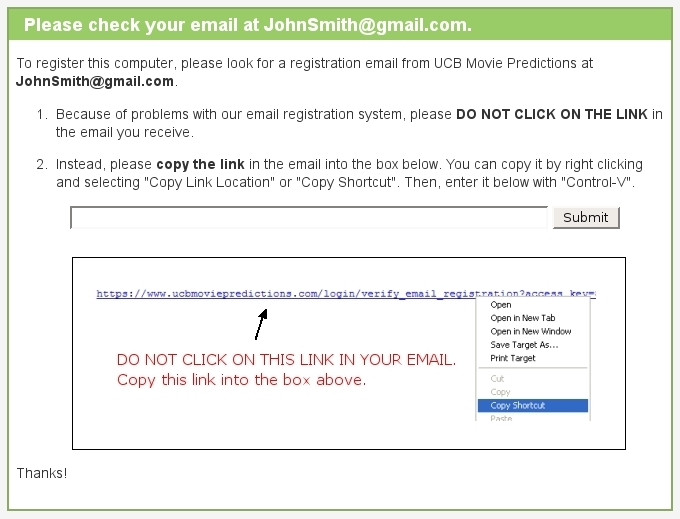 Figure 1: User interface for making predictions at our study web site. Figure 2: User interface for confirming registration. Figure 3: User interface for setting up challenge questions. Figure 4: User interface for answering challenge questions. Figure 5: Screenshot of the attack against challenge questions. 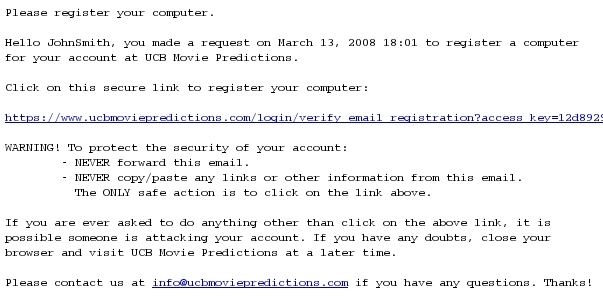 Figure 6: HTML email sent to users to register an unregistered computer (with warnings). Figure 7: HTML email sent to users to register an unregistered computer (without warnings). Figure 8: Plain text email sent to users to register an unregistered computer (with warnings). Figure 9: Plain text email sent to users to register an unregistered computer (without warnings). Figure 10: Screenshot of the forwarding attack against email registration (targeting HTML emails). Figure 11: Screenshot of the forwarding attack against email registration (targeting plain text emails). Figure 12: Screenshot of the cut and paste attack against email registration (targeting HTML emails). Figure 13: Screenshot of the cut and paste attack against email registration (targeting plain text emails). We assume the user has previously given the web site her email address, e.g., during the account creation process. Although we do not verify users have valid PayPal accounts at the start of the study, each must explicitly acknowledge she either has one or is willing to get one. Even if users select their challenge questions from a pool of possible questions, a MITM attacker can easily determine a particular user's questions by relaying communications between the legitimate site and the user [21,24]. Since these attacks simulate pharming attacks, the attacker would be able to intercept registration links and steal any registration tokens stored on the user's computer. There are various proposals which can help defend registration links and persistent web objects against pharming attacks [4,13,18], but we do not discuss the details here. Regardless, the results of this study are applicable to a wide variety of social engineering attacks, including phishing.